Yesterday, I had lunch at Gombei in San Jose Japantown. Gombei has four locations (Menlo Park, Sunnyvale, Santa Clara, and San Jose); the first store opened is at SJ Japantown. Gombei is well known for their curry dishes, and fried tofu dish. 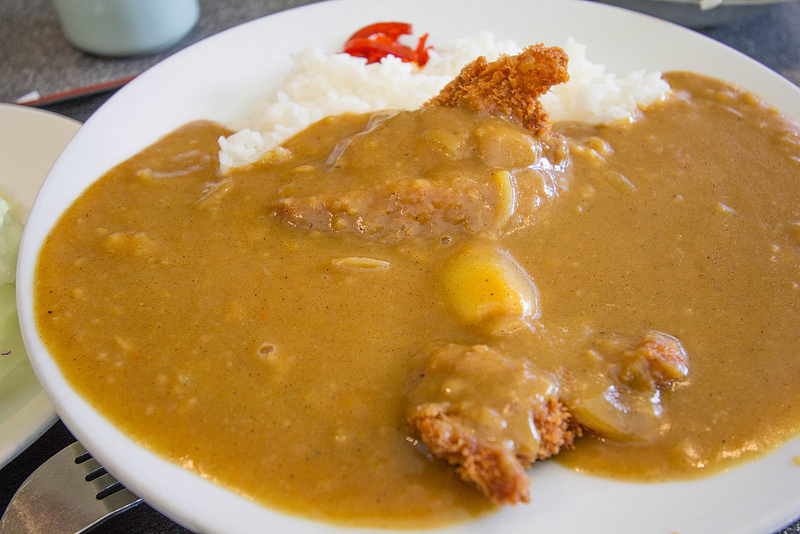 Katsu karē – curry sauce with chicken cutlet, served over rice. There were also some potatoes, onion, and carrots within the curry sauce. The red bit next to the rice was pickled radish (fukujinzuke). The curry sauce is on the thicker and sweeter side, contrary to Indian curry. Curry (カレー karē) is one of the most popular dishes in Japan. It is commonly served in three main forms: curry rice (カレーライス karē raisu), karē udon (thick noodles) and karē-pan. Curry rice is most commonly referred to simply as ‘curry’ (カレー karē).